Tidal and seasonal effects on survival rates of the endangered California clapper rail: does invasive Spartina facilitate greater survival in a dynamic environment? Invasive species frequently degrade habitats, disturb ecosystem processes, and can increase the likelihood of extinction of imperiled populations. However, novel or enhanced functions provided by invading species may reduce the impact of processes that limit populations. 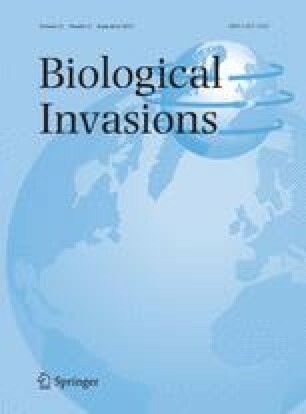 It is important to recognize how invasive species benefit endangered species to determine overall effects on sensitive ecosystems. For example, since the 1990s, hybrid Spartina (Spartina foliosa × alterniflora) has expanded throughout South San Francisco Bay, USA, supplanting native vegetation and invading mudflats. The endangered California clapper rail (Rallus longirostris obsoletus) uses the tall, dense hybrid Spartina for cover and nesting, but the effects of hybrid Spartina on clapper rail survival was unknown. We estimated survival rates of 108 radio-marked California clapper rails in South San Francisco Bay from January 2007 to March 2010, a period of extensive hybrid Spartina eradication, with Kaplan–Meier product limit estimators. Clapper rail survival patterns were consistent with hybrid Spartina providing increased refuge cover from predators during tidal extremes which flood native vegetation, particularly during the winter when the vegetation senesces. Model averaged annual survival rates within hybrid Spartina dominated marshes before eradication (Ŝ = 0.466) were greater than the same marshes posttreatment (Ŝ = 0.275) and a marsh dominated by native vegetation (Ŝ = 0.272). However, models with and without marsh treatment as explanatory factor for survival rates had nearly equivalent support in the observed data, lending ambiguity as to whether hybrid Spartina facilitated greater survival rates than native marshland. Conservation actions to aid in recovery of this endangered species should recognize the importance of available of high tide refugia, particularly in light of invasive species eradication programs and projections of future sea-level rise. The online version of this article (doi: 10.1007/s10530-013-0634-5) contains supplementary material, which is available to authorized users. We thank Tobias Rohmer, Peter Coates, Brian Halstead, and Mark Herzog for helpful suggestions in preparing this manuscript and during analyses; Peggy Olofson, Jen McBroom and the Invasive Spartina Project staff for data contributions; Steve Bobzien, Mark Taylor, and Ralph Trujillo for assistance and access to East Bay Regional Park District properties; Joy Albertson and Cheryl Strong for assistance accessing Don Edwards San Francisco Bay National Wildlife Refuge properties; and Jeffrey Lewis, Whitney Thornton, Annie Shultz, Christina Crabtree, and the USGS San Francisco Bay Field Station staff for assistance with field work. We also thank Valary Bloom and Josh Hull of the U.S. Fish and Wildlife Service for facilitating work on California clapper rails. This project was funded by the USGS Western Ecological Research Center, grants from the U.S. Fish and Wildlife Service, Region 8, Coastal Programs Branch and Recovery Branch and by grants from the California State Coastal Conservatory. It was also partially funded through the South Bay Salt Pond Restoration Project Graduate Fellowship Program. California clapper rail studies were permitted under FWS endangered species permit TE-020548, California Department of Fish and Game Memorandum of Understanding and scientific collecting permits, U.S. Geological Survey Bird Banding Laboratory permit 21142, and the U.S. Geological Survey Western Ecological Research Center Animal Care and Use Committee. Use of trade names is for descriptive purposes only and does not imply government endorsement.